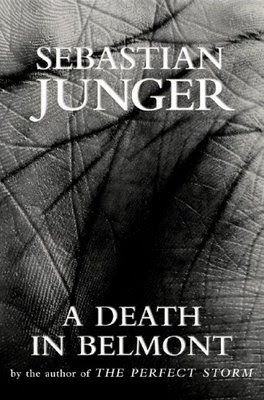 It was about a year ago that Sebastian Junger's A Death in Belmont came out (first image below). At the time I thought it was really good, and both the final designer and another designer who worked on the initial round of concepts wrote in about their experiences with this title. I still really like it. So how disappointing is the new paperback (the second image)? It's about as generic as covers get. This happens all to often when books move into paperback. A notable exception: Eat the Document (which is a great book, BTW). "the perfect storm?" subliminal cross-title advertising, maybe? The picture on the cover represents Belmont, Massachusetts about as well as the author tells the story of Bessie Goldberg’s murder. 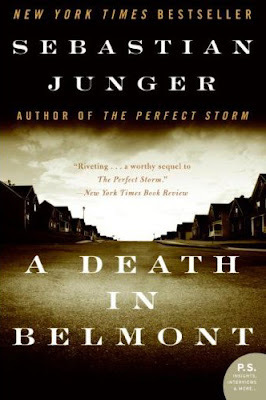 That street is not in Belmont while “A Death in Belmont” crosses the line into fiction by the second chapter. The story is a myth fictionalized for a quick buck.